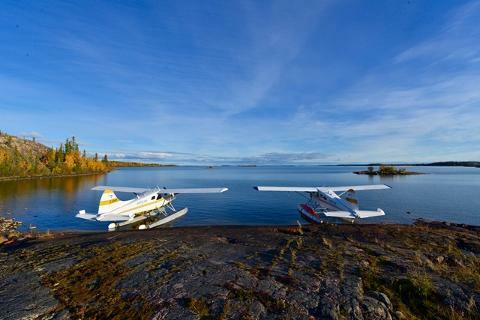 Great Slave Lake's East Arm is a world class scenic and geological wonder featuring an abundance of islands, narrow channels and spectacular red cliff drops. Some cliffs are as high as 180 metres (590 ft) off the water and plunge several hundred metres into subterranean cannons. Great Slave Lake is the tenth largest freshwater lake in the world covering an area of 27,200 km2 (10,502 sm2), the fifth largest lake in North America and also ranks as the deepest lake in North America with recorded depths of 614 metres (2,014 ft). The scenery is primeval; this remote paradise attracts boaters, fishermen and outdoor enthusiasts from around the world. 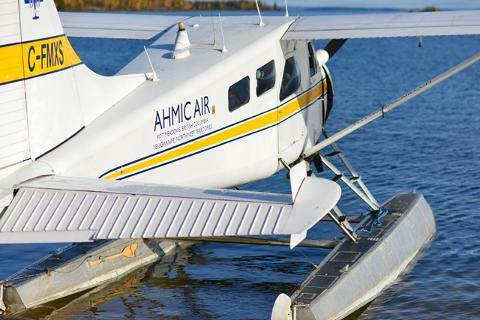 Your flight will depart Yellowknife following the shoreline of Yellowknife Bay to the main body of Great Slave Lake. We will over fly the marine routes to the East Arm passing by wonderful anchorages and passages such as Devil's Channel. We will continue up the Hearne Channel past Utsingi Point and Tatheilei Narrows to access McLeod Bay. Flying parallel to the Pethei Peninsula you will get a real appreciation for the scale of the scenery. 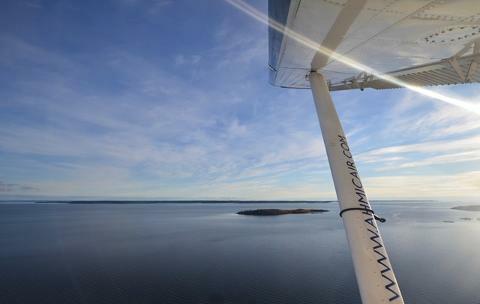 At Gibraltar Point we will cross McLeod Bay and over fly the Waldron River before heading back towards Yellowknife. 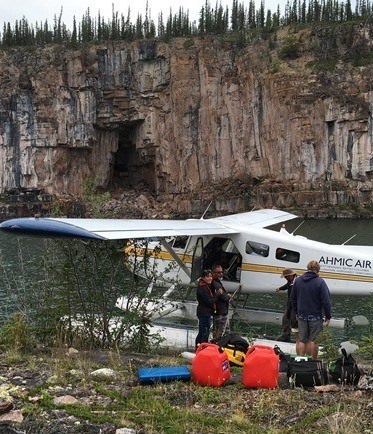 During the tour of the North East Arm of the lake you will cover over 464 km (290 sm) and at the furthest reaches of the tour find yourself 200 km (125 sm) east of the city of Yellowknife while over Great Slave Lake’s East Arm. We will find a suitable location to land during the tour to provide you the opportunity of a brief stop-over in which to stretch your legs, take in the views, and enjoy a snack. Light refreshments and snacks are provided on this tour. Feel free to bring some fishing equipment if you would like, or to borrow some of ours so that you may have the opportunity to fish these world class fishing-waters if you wish. If you are going to wet a line during our stop over don't forget to bring your fishing licence. The overland and return portion of the trip will give you a glimpse at some of the countless lakes, rivers, and wetlands in our region that have been carved into the Precambrian shield by successive glacier erosion. Approximately 4 ½ to 5 hours, dock-to-dock.